Macauley Cook has played for Wales at under-16 and under-18 level. 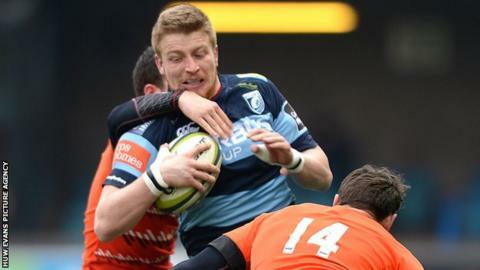 Forward Macauley Cook has signed a new two-year contract extension with Cardiff Blues which will see him stay at the region until 2018. Cook, a product of the Blues Academy, made his senior debut against Exeter Chiefs in 2010 and has made over 60 appearances for the region. The 23-year-old was named most promising player of the season by Cardiff Blues coaching staff in 2014. "I feel really privileged to be a part of this region," he said. "It shows that the region and the staff have confidence in me to offer me a long term deal like that. I have worked hard for it but I am privileged, honoured and excited." Director of rugby Mark Hammett added: "Macauley is a leader who leads with heart, that's not to say he doesn't have a brain, he is an intelligent guy, that's why he calls the line outs."